I’m in the middle of the worse exacerbation I have had. No, I haven’t lost the use of my legs, arms or eyes. I have excruciating pain reverberating up and down one side of my head. Apparently it is trigeminal neuralgia. http://www.mayoclinic.com/health/trigeminal-neuralgia/DS00446/DSECTION=1 It’s not pretty people. The only way I’m not writhing in (intermintent, but seems pretty frequent) pain is by taking a load of drugs…then I’m stupid. I can’t wash my hair, bend over, eat anything hot, cold or bubbly. The girls can only kiss me on one side of my face and unfortunately they know it. I feel so guilty for not cooking and cleaning and most of all not working. I had to call in. It makes me sick. I have just given my notice and want everything to be perfect before I leave and I can’t stand to hold the phone to work. Guilt, guilt, guilt. I feel like I have a big fat looser sign on my forehead. Well…that was a big long whine. On to better news. 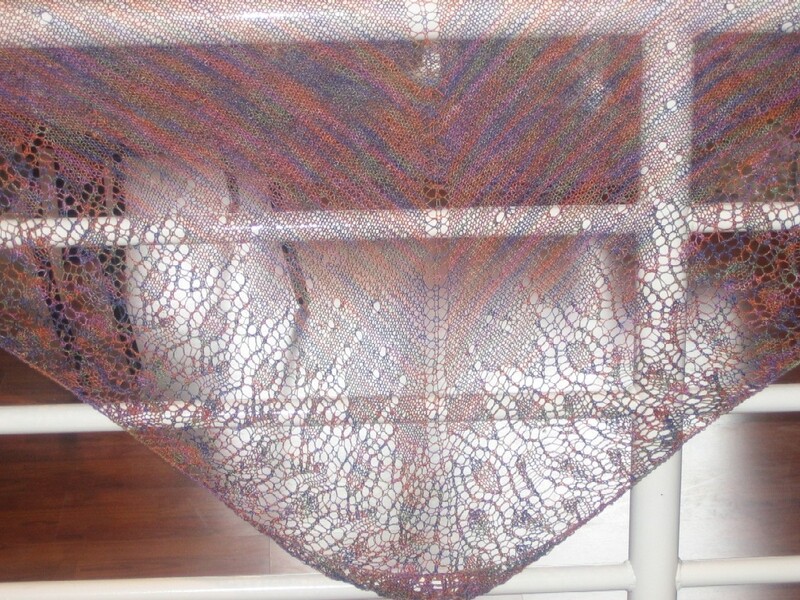 I finished the shawl for Grey’s school. They had a silent auction. I raised $11,000. I’m not sure how much the shawl fetched. I know it was over 60 or so. 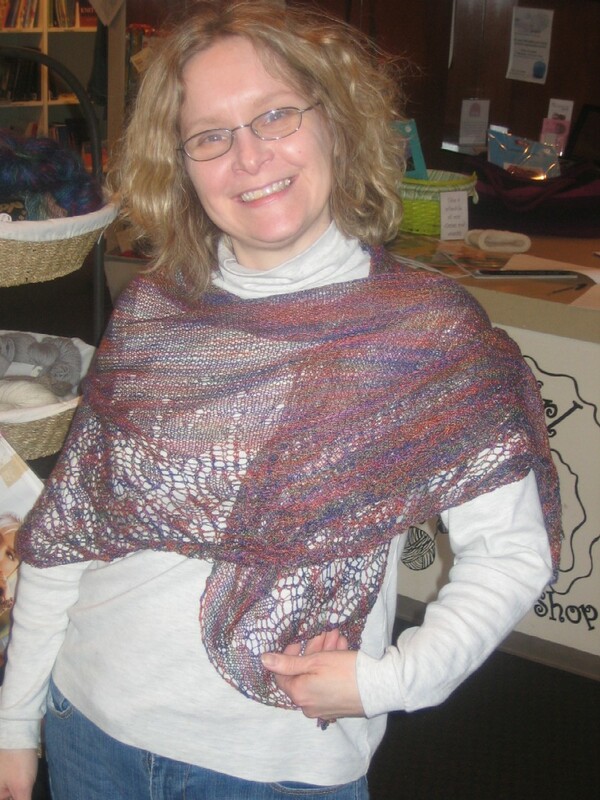 Here it is modeled my my friend Anne at Crazy Girl Yarn Shop in Coralville. So, I’ve had six comments with six people named. I know another 4 plus my MS group of about 20….so with just a week’s worth of asking and only six people commenting, we’ve found 30. So, what was the point? I think the point was that we all stood still for a minute and thought about it. I think awareness is the first step. The next would be activism. That is one I plan to work on. I have walked in a 50 mile walk to DC and raised a good deal of money doing it, volunteered for the MS Jack and Back in TN and donated to various other riders or walkers through the last couple of years. I’m going to figure out how to do more during this next year…but in the meantime: Shelia, I’m on Rebif and would be more than happy to talk to you about it. Also, I got to know some great people in the MS community back in Nashville and I would love to hook you up. Anyone else out there struggling personally or know someone struggling with dealing with the MonSter….email me. I will be happy to lend an ear, maybe that’s what I can do to help right now.